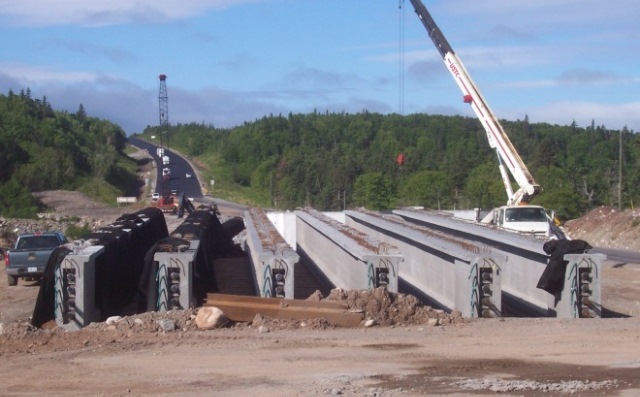 HEC, acting as a sub-consultant to the prime consultant, provided the detailed design of a 76 meter long, two span, semi-continuous, concrete girder bridge founded on skin-friction piles and a semi-integral abutment design. The girders were 1900 mm deep, site cast, post-tensioned concrete girders. The project included full technical support during construction, including HEC presence on site to monitor the stressing of the girders. HEC provided, in a short time frame, an alternate spread footing abutment design when difficult driving conditions were encountered at one end of the structure. The re-design minimized project delays and demonstrates the level of support during construction that HEC provides for their clients.